We aim to develop professionals who have high specialty and who can apply problem-solving abilities flexibly to the international community. With the purpose of fostering global leaders who can create and realize the growth strategies for the next generation, we prepare a variety of coursework, such as discussions with top leaders of industry, academia and government, and study of international business development with the cooperation of businessperson mentors. 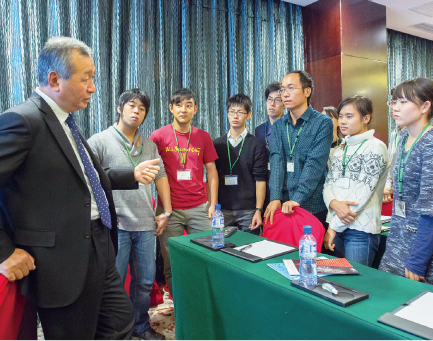 We mainly offer opportunities for practical training in “Frontier Asian” countries such as Cambodia, Mongolia and Vietnam, where Nagoya University has built research bases. Those countries are full of the vitality of economic growth, and students learn by themselves in different fields and cultures. We develop human resources with abilities for autonomous proposal making and resolution, communication and management, international mind and cultural understanding, understanding of different fields, and abilities of debating and self-expression, which are essential to become global leaders, who can solve international problems. It is indispensable for global leaders to have communication skills and cultural understanding, as well as a proactive attitude to express their own opinions. This program provides language training in cooperation with the British Council, and fosters English proficiency including the understanding of cultural aspects. Through a variety of coursework consisting of lectures on international issues as well as Japan’s cultural experience, students develop cultural understanding concerning the differences between their own culture and the cultures of others. During the master’s course, students are obliged to participate three times in overseas training in Frontier Asian countries and the UK. Furthermore, we carry out an “Ambition Camp” utilizing Nagoya University’s base in North Carolina, USA, during the doctoral course. Students learn about entrepreneurship and the business society in an international environment. Mentorship is also one of the major features of this program, which will lead to a better overall understanding of the students’ fields as well as changing in consciousness and behavior. In the master’s course, young professors from different fields are assigned as “Young Mentors” and help students to understand different fields of research. In the doctoral course, in cooperation with companies and governmental agencies, businesspersons are invited as “Business Mentors,” to share their practical experience and knowledge. The advice of mentors will help students build a vision and career path for the future.